Finally. All of the bananas are gone! I feel like I never want to see a banana again. I don’t even want to have them one my breakfast cereal. This cookie is moist and chewy – but it is almost too sweet for my taste. It is also an interesting cookie recipe because it doesn’t have oil or eggs. I think that the mayonnaise (in a cookie!) takes their place. Preheat oven to 350. Line a large cookie tray (pr two trays) with parchment paper (HINT: if you want the parchment paper to lie flat on your pan, spray the pan lightly with cooking spray before you lay the paper down). Place brown sugar, mashed banana, mayonnaise and rum into the bowl of a mixer and beat at medium speed until well blended. Lightly spoon flour into measuring cups and level with a knife. Combine flour and remaining ingredients in a medium bowl and stir with a whisk. Stir flour mixture into banana mixture. Drop by heaping tablespoons onto the parchment paper lined cookie sheet making 20 cookies. Bake at 350 for 20-23 minutes or until lightly browned. Remove from baking sheet and cool completely on a wire rack. This makes 20 cookies with about 2 grams of fat/cookie. Variation: The original recipe for these cookies had ½ cup of chopped walnuts, added at the same time as the raisins. But that just seemed like one too many ingredients, and since I was thinking of these as tropical, it didn’t go with the theme. You can add them, but the cookies would then have 3.7 grams of fat/cookie. Confession: I was making these cookies at 2 a.m., and I accidentally put a tablespoon of rum in instead of a teaspoon. It was promptly absorbed into the brown sugar. I frantically scooped out most of the soaked brown sugar and added dry brown sugar back in. They still tasted a little to rummy – sort of like soaked fruitcake. Family confession: Late night cooking is a family tradition. Allegedly, my father hated the smell of baking, so my mother would bake late at night after he had gone to bed. In truth, I think when we were teenagers it gave her an excuse to stay up until we came home from our night-time escapades. Whenever we asked her why she was up so late, she would say she was chopping nuts. I still miss her. Banana and biscotti are two words that just don’t seem to go together to me. Banana things are soft and moist; biscotti are hard and crunchy, ready for dipping in coffee or tea. But in my banana overload desperation, I was looking for something other than bread and muffins. 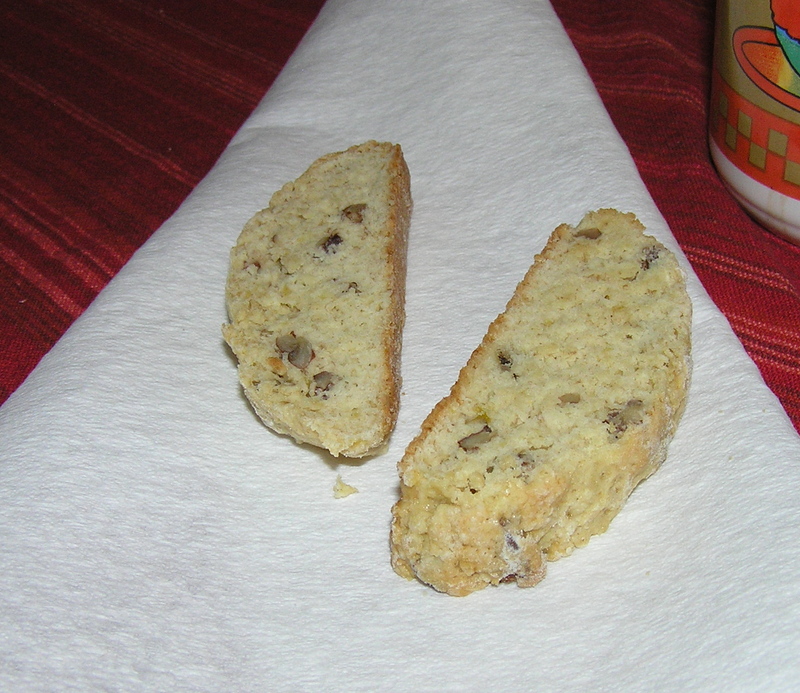 These biscotti are quite good, crispy on the outside and not too sweet. The original recipe came from Cooking Light magazine. Preheat oven to 350 F. Lightly spoon flour into measuring cups and level. In a medium bowl, combine flour, sugar, baking powder, and salt. In another medium bowl, combine mashed banana, oil, vanilla, and egg. Add flour mixture and pecans to banana mixture, stirring in thoroughly. The dough will be sticky. Turn the dough out onto a lightly floured surface. 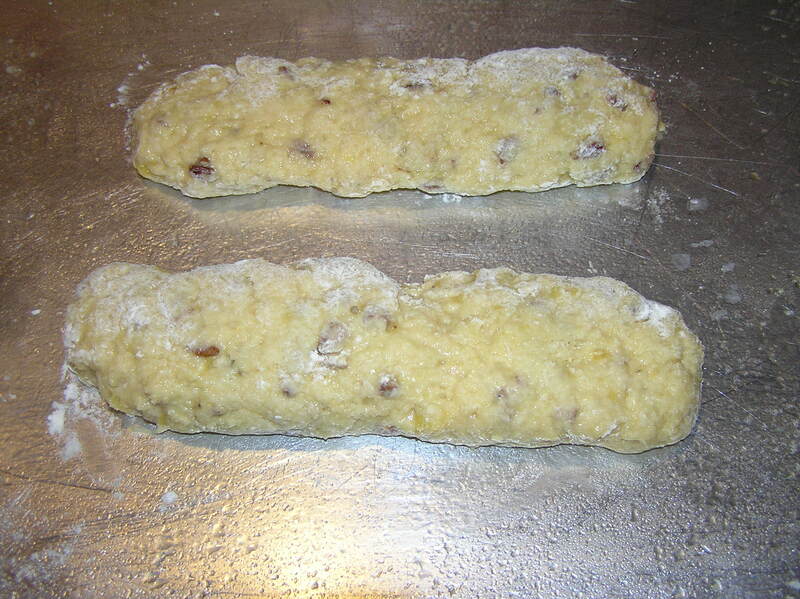 Divide the dough in half and, with floured hands, shape each half into an 8 inch long roll. Place rolls on a baking sheet covered with cooking spray and flatten each one to ½ inch thickness. Bake at 350 for 23 minutes (they will start to brown slightly). Remove rolls from baking sheet and cool them on a rack for 10 minutes. Cut each roll on a slight diagonal into 12 pieces. They should be about ½ inch wide. Place slices cut side down (on their sides) on the baking sheet. Reduce oven temperature to 250. Bake the slices at 250 for 15 minutes. Turn cookies over and bake an additional 15 minutes. Remove from oven. Cookies will be slightly soft, but they will harden as they cool. Remove from baking sheet and cool completely on racks. This makes 24 biscotti, with 2 grams of fat/cookie. I am awash in bananas. The reason for this plethora of bananas is that while I am convalescing, I have been ordering groceries to be delivered to my home. Now when you buy bananas in the grocery, you probably pick a bunch of 5-6 bananas, enough for your current needs. You don’t think about the bananas’ weight. On the order form, the bananas are ordered by the pound, so I blithely ordered 5 pounds (believe me, a banana does NOT weigh a pound). This resulted in a very large number of bananas, which are rapidly becoming very, very ripe. So, in addition to a loaf of my traditional banana bread, I made these muffins. 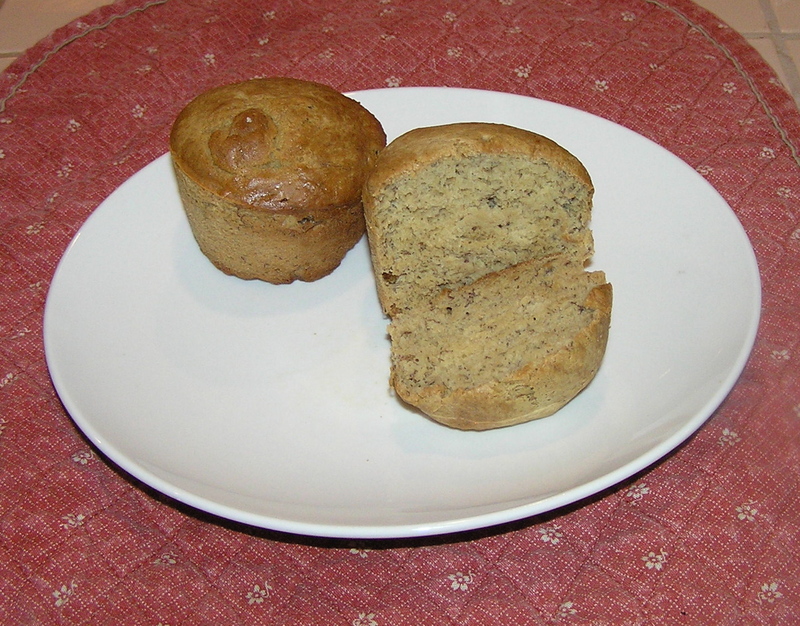 It’s the banana bread recipe with the addition of rum and walnuts, and is a nice variation for a late in the day snack. There are still bananas left, so more banana recipes will follow – a nice respite from the traditional pumpkin bread and turkey recipes that you usually see at Thanksgiving. Preheat oven to 350 F and place rack in center of oven. Spray a 12 cup muffin pan with cooking spray. Whisk the flour, salt, and baking soda together in a medium bowl. Put the bananas into the large bowl of an electric mixer and beat them until they are well mashed. Beat in the egg substitute. Beat in the sugar. Add the flour mixture about 1/4 cup at a time, until it is incorporated into the banana mixture. Beat in the rum, and fold in the walnuts so they are evenly distributed throughout the batter. 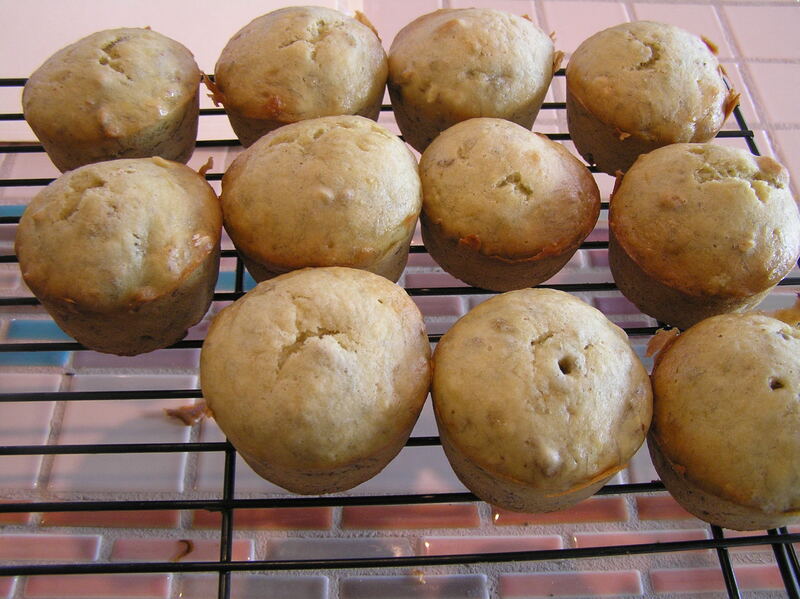 Pour the batter into the prepared muffin cups and bake 20-25 minutes, or until a toothpick inserted into the center of a muffin comes out clean. Remove from oven and let cool 10 minutes. Remove the muffins from the pan and cool on a rack. Makes 12 muffins, with about 2.5 grams of fat/muffin.